Modern politics is (unfortunately) more about expectations than about reality. Consequently, Gallup ran a poll BEFORE the third debate asking who was going to win? 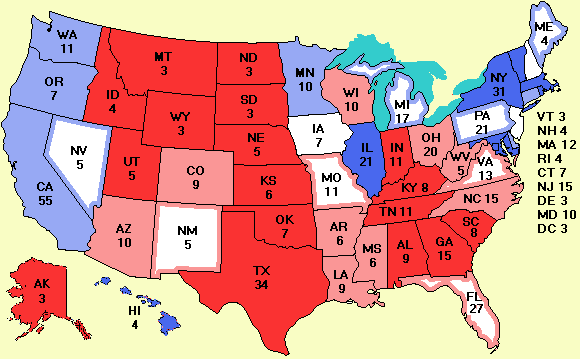 The results: 54% expected Kerry to win, 36% expected Bush to win, 10% expected a tie. Now for the actual results. After the debate, a Gallup poll showed Kerry to be the winner 52% to 39%, not far from expectations. 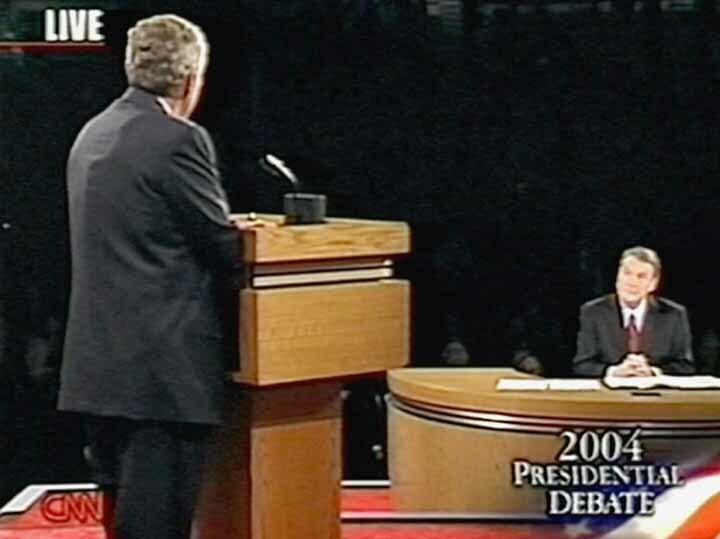 A CBS poll of uncommitted voters after the debate showed that 39% thought Kerry had won and 25% thought Bush had won. An ABC News poll showed Kerry barely won, 42% to 41%. However, the ABC poll had 38% Republicans and 30% Democrats, so breaking even in a group skewed towards the GOP has to be considered a Kerry win. Survey USA didn't run a large-scale poll this time. Still, the clear conclusions: Kerry won the first and third debates; the second one was a tie. Cheney did better than his boss and won the VP debate. A new ARG poll in Iowa makes that state a tie again, but other than that, no states changed today. The Economist ran a national poll Oct. 11-12. It was a statistical tie, with Kerry at 47% and Bush at 45%. On the subject of Bush's job approval, 44% said he was doing a good job vs. 52% who said he wasn't. Since incumbents rarely score much above their approval rating, this has to be worrisome to Karl Rove. Of some note to people who have followed the "bulge" story, one of the questions The Economist asked was if the respondent saw the picture of Bush with the rectangular bulge. Of those who saw it, 49% said he was wired for getting help by radio. Fortunately for him, only a quarter of the respondents saw the photo. Several people from the TV world have told me that his poor performance in the first debate might have been due to the fact that it takes a lot of practice to listen and talk at the same time. The first few times you try it are said to be confusing. Senate news: The salon.com story I referred to yesterday about Sen. Jim Bunning (R-KY) using a TelePrompTer during his debate with state senator Daniel Mon.. has been confirmed. The Kentucky Post reports that Bunning's campaign has admitted to using a TelePrompTer to read his opening and closing statements but says that was not cheating. Next question. Why would an incumbent U.S. senator who has given thousands of speeches on and off the floor of the Senate need a TelePrompTer? In a state as heavily Republican as Kentucky, all he would have had to do to be re-elected is to repeat three times: "I fully support President Bush and as a senator I will vote to give him whatever he requests to defeat the terrorists." My guess is (1) he has Alzheimer's disease and (2) Kentuckyans just love horse races and they are about to get one for the Senate. As soon as I can get my hands on a poll there, I will report it.